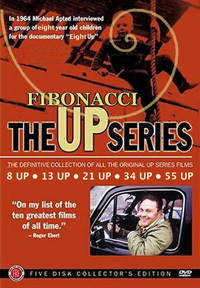 A few weeks ago, I was out having a few drinks with friends when the discussion revolving around TV and movies turned to the latest installment in The Up Series (7 Up, 14 Up, 21 Up, etc.). Feeling the effects of alcohol (like you do), I wound up twisting the series concept into something a little more humorous: The Fibonacci Up Series. I’d been meaning to do something with this idea for a while now. I suppose it could have started with age five, but since the original series started at age seven, and eight being the closest number in the sequence, I decided to start there. So, what to do on Superbowl Sunday when you don’t watch football, it’s too bloody cold to spend much time outside (-13ºC, not including the windchill), and you’re in the final “hurry up and wait” stage of your wife’s now overdue pregnancy? Why, screw around with Photoshop™, of course.